This recipe went together very quickly. 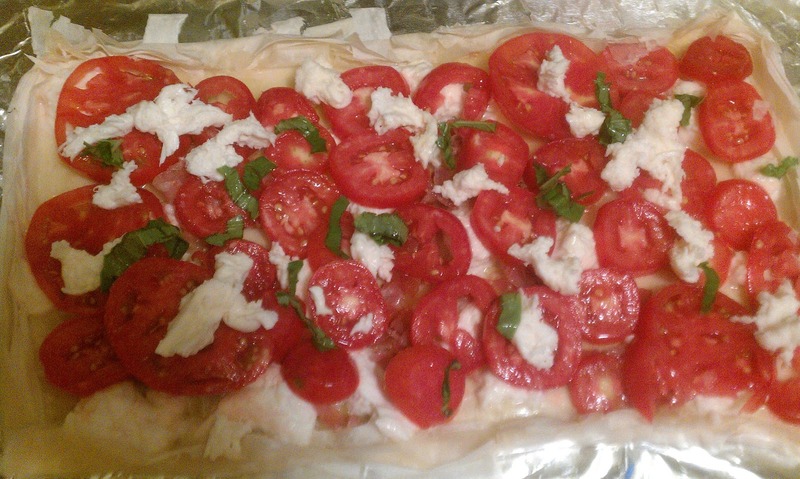 I sliced about 10 Roma tomatoes, tore 8 ounces of fresh mozzarella into pieces, and diced about two cloves of garlic. I added the garlic to a small bowl of olive oil and proceeded to brush 7 pieces of phyllo dough, which I then stacked on top of one another. I should note that the phyllo dough that I used was thin sheets, if you use the traditional thick sheet puff pastry dough (such as Pepperidge Farm) you would need 1/2 of a package (one sleeve) or the amount that satisfies your needs. Then I scattered about 6 ounces of the cheese and laid the sliced tomatoes on top. Finally, I added the last 2 ounces of cheese and a couple of tablespoons of fresh chopped basil. I put the tart into the oven for around 20 minutes at 400 degrees*. Everyone in my house was impressed with this tart. I served this dish for breakfast and it was a great, fresh way to start the day. My two boys liked it enough that they ate the leftovers for lunch the next day. This tart is a great way to use fresh tomatoes and has a great, light taste. *I originally posted the temp as 350, but going back over my notes it was 400, sorry for the confusion! Thanks for following my blog. Following you back. yummm...would love to try that! Thank you for the follow. Returning the follow. Yum-that tart is making me hungry. So nice that you have so many gardening friends to give you fresh veggies! Thanks for sharing this tasty dish. Thanks for stoppin' by for a Latte'. I am happy to return the follow. I love this recipe as it would be ideal to use right now as I have lots of fresh tomatoes in our garden! thanks for stopping by! cute blog! I'm stuffed from dinner and I'd SO eat this right now!!! Stopping by from Monkey Around Blog Hop & your newest follower on GFC, FB and Twitter! Hope you stop by and check us out and return the favor!! Have a great week!! Thanks for stopping by Spigot Blog. I'm following you back. @Jenny The addition of the spinach sounds delicious! I'm glad that you read my blog regularly, thanks for the support! I hope your tart turned out well! Can I feature it on my blog this Friday? Send me a note via email! @E I sent you an email! I love being featured on other people's blogs, thanks for asking! oooh......this looks yummy!! My hubby would love this!! Thank you for the follow, returning the follow!